Sometimes, no amount of fiddling with aperture, shutter speed, and ISO on your Nikon D3100 will produce a bright enough exposure — in which case, you simply have to add more light. The built-in flash on your D3100 offers the most convenient solution, but you also can attach an external flash head to the camera. 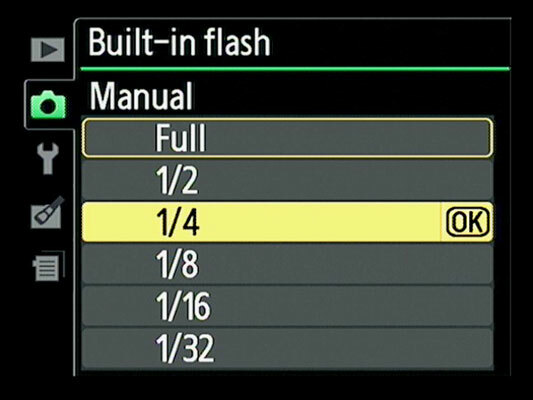 Whether you use the built-in flash or an external one, you can set it to go off automatically or manually. Display the Shooting menu and select Built-in Flash. The TTL setting is the default flash setting, in which the camera sets the proper flash power for you. TTL stands for through the lens. Highlight Manual and press OK. Highlight the desired flash output and press OK. Your options are from Full power to 1/32 power. The next time you use the built-in flash on your Nikon D3100, it emits a burst of light at the power you specify. While manual flash control is enabled, an icon that looks like the Shooting Info screen’s Flash Compensation icon (lightning bolt with a plus-minus sign) blinks in the viewfinder. If you want to get really tricky, you can employ Flash Compensation even with manual flash control.